Electric motors have become increasingly popular for paddlers. That little extra power helps you return to shore after wind or current changes and your paddle trip can be extended when you rely on a motor. The Bixpy Jet motor is readily adaptable to most fishing kayaks. Viking Kayaks have installation kits available for the Profish models: the PF Reload, PF GT and PF 400. The propulsion power pack has been developed in the US by guys that paddle their kayaks too far. 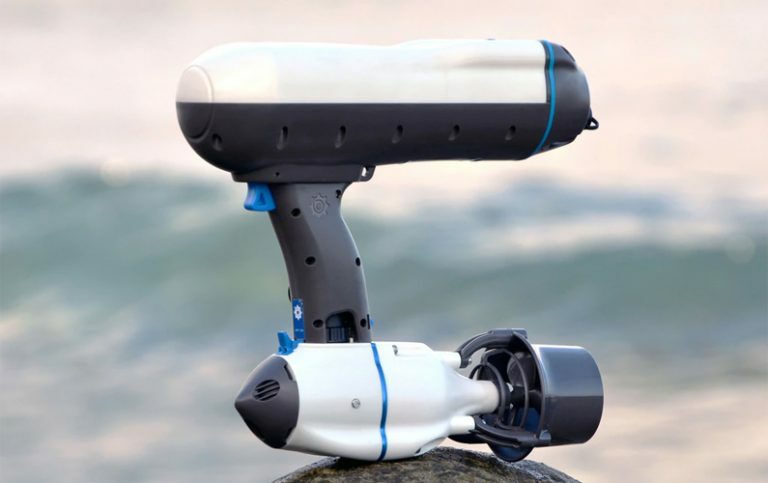 The Bixpy self-contained package contains a power pack, a Bixpy wireless remote control, and a motor unit based on using impellers rather than propellers. These two features allow for high efficiency. Packages are available for kayaks, SUPS and swimmers. We were requested to install a Bixpy unit onto a PF Reload. The propulsion unit was mounted to the rudder which gave instant steerage through the standard Viking Kayak rudder configuration. The power unit was installed inside the Chill Pod, and because it is a completely water proof unit, required no further protection. A motor lift mechanism was installed – a simple pull mechanism – which could be operated by the paddler. This installation provided for the quick removal of the motor and return to the standard Viking Kayak Reload configuration using stainless steel D-shackles and clips. The battery was able to be disconnected leaving no remnants on the deck of the kayak.